We recently undertook a build for Regain Hearing in Kent who offer hearing aids, hearing tests and hearing healthcare in Kent. The build itself was interesting because they provided a huge amount of images which allowed us to do what we like best, make the site really visual. Something that we don't normally do is support a Practice who holds many events. 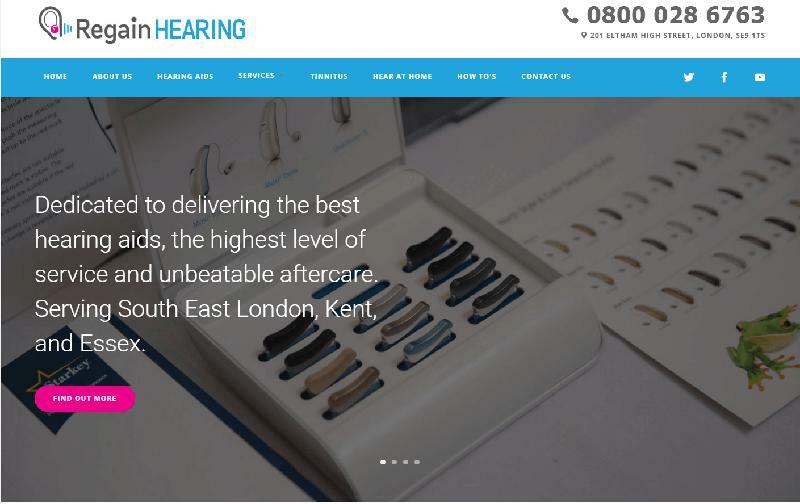 Regain hearing is different, they were mostly a domiciliary business and they hold regular hearing aid events across Kent. They are currently opening their first full time branch in South East London, but they will still continue to hold events and undertake domiciliary visits. We needed to work out a way to support those events in search and on the website. We decided to use a splash section on the home page and serve it first up under the header. This leads to an events page that we change as new events are organised. According to our tracking this seems to work well enough with some click through activity from the home page to the events page. It is something we will continue to track to see how it goes and adapt our strategy if need be. We may switch to individual pages for each event, but because they are momentary as opposed to permanent events we aren't sure that makes sense. The challenge for us was this was a brand new website that never existed before, so we knew it would be a challenge to get it to rank quickly. However, two weeks in, it is on the front page for relevant searches in the Kent area. At present it is low on the front page, but we think with some more on-site and off-site work that should change over the next few weeks. Overall the design experience was okay, Regain have more ideas about design than our normal customers. So there was some to and fro about appearance. The changes are nearly all undertaken at this stage and the site will soon be visually finished. Most of the changes are small visual tweaks. At present the site doesn't have a video header, however, Regain are going to source the video so we can embed it quite soon. I know I talk about it constantly but we know the video headers increase engagement and conversion by a huge margin. So any questions, any comments, give us a shout.